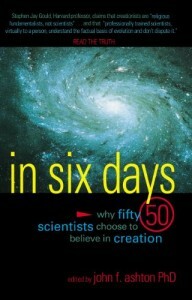 As a former biochemist (I’m in computers now), I totally identified with Geoff Down’s story of how he became a creationist (from the book In Six Days: Why 50 Scientists Choose to Believe in Creation). Here’s my redux, with quotes from the article. 1. Evolution has big holes in it, but it is taught as fact. This lecturer was teaching us that natural law cannot explain how the universe as a whole can increase in order. Therefore, science cannot explain how this order originated. However, he also (I assumed) believed in evolution. I had never been taught that there were aspects of evolution that scientists could not explain. 2. Both sides of the origin debate are missing data and are equally plausible – or implausible. I thought that if I held to a belief in special creation, as explained in Genesis, then I was holding to a faith position, whereas scientists had evidence to support their view. This lecture helped me to realize that if scientists can’t explain all the evidence for evolution, perhaps I don’t need to have all the answers for a creationist position either. That day I stepped outside of my evolutionary, long-age mind-set, started going to other lectures, and endeavored to evaluate the evidence from both viewpoints. What I found was that the overwhelming majority of the scientific evidence we were taught bore no direct relation to either creation or evolution. The evidence that was presented within an evolutionary framework could equally well be reinterpreted within a creationist framework. 3. Evolutionists don’t claim to have all the answers because science develops – and therefore, neither do creation scientists. But I knew that, if these lecturers could be inconsistent in the sense that they were not able to make the evolutionary framework fit the evidence at every point, then I could also hold in â€œtensionâ€ those areas of science that I could not explain within a creationist framework. My understanding of the creationist perspective became steadily stronger in its ability to accommodate and explain the real scientific evidence. Often I hear the argument that science cannot allow the presupposition or conclusion that a Creator exists. The moment you do, you supposedly step outside the realm of science. This is not so. 5. Naturalistic evolution fails philosophically, in that it can not be integrated with the foundations of logic. I have come to realize that evolution is a religious view founded on the assumption that we can discern truth by using the abilities of our mind to reason and think logically through the evidence perceived by our five senses. However, if we pursue that reasoning, we ultimately arrive at the conclusion that we have no logical basis for believing that we can reason logically. We cannot prove that our thought processes are not just random chemical reactions occurring within our brains. We cannot prove ultimately that we exist. Descartes was wrong when he said, â€œI think, therefore I am.â€ The decision to trust our ability to reason is a faith step. The theory of evolution is founded on this step of faith. However, even to be able to begin to have confidence in my ability to reason, I have to start with a revelation from the One who made me. Seeker, the moment that you presuppose the existence of an invisible, all-powerful God, you are stepping outside the realm of science. What is scientific about making an assumption that has no basis in evidence and cannot ever be proven? If you want to criticize mainstream science and evolution, that’s fine. You can even claim that they are not scientific, though many will argue with you. But you can’t legitimately claim that a belief in God is a scientific one. However, if we pursue that reasoning, we ultimately arrive at the conclusion that we have no logical basis for believing that we can reason logically. It works really well, though. And, may I be the first to welcome you to the 20th century, where hopes for apriori epistemologies that ground knowledge in some unshakeable foundation have been abandoned. Often I hear the argument that science cannot allow the presupposition or conclusion that a Creator exists. No you haven't. What you may have heard is that trying to explain X in terms of God isn't a scientific explanation. And that's correct. It doesn't mean that only scientific explanations are correct, of course, and it doesn't deny God His place. My above comment was partially stupid; while I stand by the obnoxiousness of my 'welcome to the 20th century' bit, the part about necessarily excluding God was incorrect. To whit: if God came down, gave irrefutable evidence of His existence (turning water into wine, vitamin pills into amphetamines [anyone else remember that Dead Milkmen song? ], etc. ), and said He created the world 6000 years ago, science would still have a task before it. It'd try to figure out what processes He used to cram all that work into 6000 years. The major issue with the creation-evolution debate is that neither builds theory based on deep enough science. I have heard creationists quote Einstein's quip, "God doesn't play dice," and have to laugh at it because Einstein said it from an emotional standpoint, not a scientific one. The rate of religious belief among physicists is pretty high; around 30-40 percent. That's a lot of physicists. jpe, that’s sort of meaningless. I mean, imagine what the rate was two-hundred years ago. Surely it must have been nearly 100%. What’s interesting is that — today anyway — the number is so low relative to the rest of the population. jpe – i agree that saying "God did it" is not science. However, since the foundational assumptions of both camps are by definitionn "unprovable", a deist assumption is just as valid, and in some ways, more valid because it is "consistent with" other disciplines, such as that of philosophy and logic. That's the point. Assumptions are by their very definition, unprovable – yet some are more "reasonable" than others, and the deist assumption, and the corrolary argument from/for design, is not unreasonable. The fact that physicists "believe in evolution" is, IMO, probably not based on the science as much as it is in their investment in evolutionary assumptions. As the author above wrote, I'd say most of scienctific data could fit into either model (evolutionary or creationist), and the creationist model in some ways fits the data better. To say that the data is "consistent with" evolution does not prove evolution at all, any more than saying it is "consistent with" creationism – however, if one model is "more consistent", now we've got an argument. Agreed, but the godless assumption has gotten us very, very far. Ya don't take a working car to the shop, after all. Hugh, Ockham, Oresme, Robert Grosseteste, Roger Bacon , Leonardo da Vinci, Sir Francis Bacon, Johannes Kepler, Galileo Galilei, Blaise Pascal, William Harvey, Robert Boyle, Sir Isaac Newton, Antony van Leeuwenhoek, Carolus Linnaeus, William Herschel, John Herschel , Georges Cuvier, Samuel F. B. Morse ,Michael Faraday, Charles Babbage, James Prescott Joule, William Thomson, Lord Kelvin , James Clerk Maxwell, John Napier, Leonhard Euler, George Boole, Bernhard Riemann , Copernicus, Brahe, Flamsteed, Davy, Dalton, Henry, Fleming, Gregor Mendel, Louis Pasteur, Joseph Lister, Henrietta Swan Leavitt, George Washington Carver, Wernher von Braun. Galileo? Wasn't he the guy who was forced to recant his scientific findings by Christianity under threat of torture? All Christians, and all did science by presupposing God out of the (natural) picture. JPE – I don't think your unsupported one liner is accurate. Check out the info on the link I provided – and the point is that most or all of these had a deist view – that is, that there was existing order because of a creator, not because of evolution. The Galileo affair cannot serve as an argument for any position on the relation of religion and science. Contrary to legend, both Galileo and the Copernican system were well regarded by church officials. Galileo was the victim of his own arrogance, the envy of his colleagues and the politics of Pope Urban VIII. He was not accused of criticising the Bible, but disobeying a papal decree. Actually, I would also argue that the designer view has gotten us very far…. I do not deny the value of the building blocks that were set up with the presupposition that the divine had a hand in things. However, scientific progress with ignorance to the fact that there isn't necessarily divinity at work does not support the argument that divinity is — or has ever been — at work. (Also, I'd like to point out that not a single person listed in that post is alive and practicing science today.) Science is no exception to evolution; Einstein expanded upon Newton's discoveries (showing that Newton's laws were only applicable given a certain set of parameters), and Heisenberg expanded upon Einstein's discoveries (showing that Einstein's theories were only applicable given a certain set of paramters). The issue, even in the above citing of evolution being applicable to science, is that we have moved into a realm of science where we have the mathematics to prove theories, but not the physical means. As far as anybody can prove, Einstein's theory of relativity is fact, however it has not been physically proven so it's still just a theory. If it is the stance of creationists to argue that evolution is merely a theory and the gaps therein can be filled with whatever faerie magick rides the prevalent winds of the day, then they might as well fall back to Newtonian physics and shut up. (This would mean they would have to stop using computers which rely heavily on "unproven" science, and would thereby remove the nonsense they post to the InterWeb…which this might not be a bad thing for the realists on the InterWeb, come to think of it.) That's not to say that Newtonian physics don't have their place, but science have evolved into a more complex beast since Newton was bleeding edge. Newtonian physics are a good starting point, but anyone serious about modern science has to push past that. I think the same applies to "theological" science: it must be moved beyond to function in a time free of "faeries of the forest did it" scientific theories. All of that said, I believe that it is important for a lot of people (including the high percentage of religious physicists) need and/or want a deity for spiritual reasons, I think it ignorant to bring that deity into the realm of biology. 1. The difference is, relativity can be prove with experimentation, while evolution can't. 2. If newtonian physics were a good starting point, are they still true? If yes, then your analogy holds that creationism, or at least deism is still true, but somehow evolution, like relativity, supercedes it? Would that make you a theistic evolutionist? 3. Religious truth and other realms of truth are not independent – since all truth is interconnected (being part of the same reality), you can't have spiritual truth and scientific truths that disagree – if you do, one or both are wrong. This fallacious "separation of spiritual truth and science" is an modern (materialistic, industrial age) stance which many of us in the post-modern world see as a mistake, maintained by the scare tactic of scientists who lack the skills to separate spiritual principle and truths from superstition and myth. Those who abandon evolution do it for at least two reasons – (1) for religious reasons, because they find it disagrees with religious principle, and (2) because they believe it is bad science and contradicted by the evidence. A third reason it is resisted is because its unprovable assumptions are treated as fact by the establishment (i.e. it is now orthodoxy), and the fact that this orthodoxy (a.k.a. faith) is defended so blindly as fact makes those of us interested in honest intellectual dialogue disenchanted, mistrustful, and downright pissed off of at the priests of evolution intefering with science. Contrary to the popular picture painted by science today, those standing in the way of free inquiry and truth are the scientific dogmastists who swear by evolution, not the IDers or the creation scientists. But of course, their rose-colored view of creation science makes them see fundamentalists behind every tree. that is, that there was existing order because of a creator, not because of evolution. In other words, God designed things to be discovered through the presupposition of natural processes – God invented order and created such that it looks like naturalism. Interestingly, it's like the philosophical "brain in a vat" – there's this whole virtual world that designed to look exactly like the real world. Of course, Christians have thought this for awhile: God created the world to perfectly mimic what the world would look like if it had been designed by natural processes. Hey, whatever ya gotta tell yourself. Your circular logic is a straw man. Christians don't argue with most naturalistic processes – they only have an issue with the science around origins. They believe that everthing was formed perfectly, but then ruined by the sin of Adam and his progeny. They believe that the geographic column and its layers are not the result of millions of years of deposits, but evidence of a global (Noahic) flood and rapid deposit of sediment. Based on these assumptions, they want to do science – and these assumptions seem to fit the data better than the fanciful evolutionary model. It's all about biblical assumptions of origins and history, not this supposed increase in order through random mutation nonsense. That's the point, I think.